As a DIY PPC’er or first timer it’s difficult to know how much to spend on PPC (Google Ads or Bing Ads). It probably an even harder decision to know how much to spend on a Pay Per Click company. What you have to appreciate though is, a ppc agency are not a cost to your business if you are already doing AdWords, they’re going to save you money! 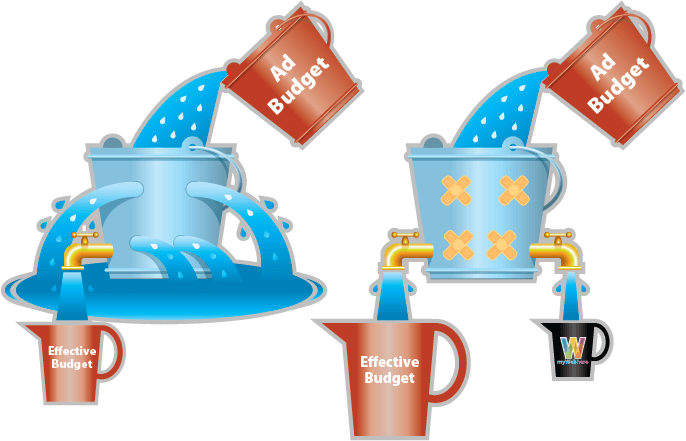 At myWebhero, we plug all the holes in your PPC campaign so that your budget is as effective as possible. Any good & reputable PPC company will do the same, but there are some questions you should ask of them. Do you have certified PPC professionals? Do you hold the Google specialisation for my campaign? Get in touch with myWebhero to optimise your pay per click campaign. We don’t talk in jargon & provide clear transparent reporting so you know where every penny of your campaign is being spent, including your PPC management fees. Contact Us about PPC now. If you’ve set up your own AdWords campaign, you probably appreciate how complex a tool it really is. Here are our top tips for optimising your campaign. Negative Keywords – add them, lots of them! Ad Extensions – make use of Snippets, Callouts, Site Links, Call & Message extensions, location and price extensions. Location – check your target location, it defaults to whole world! Bid Modifiers – change bids based on location, gender, age, mobile device etc. Need help? If you’re not sure how to get the best from your ad campaign and are becoming overwhelmed by it, fear not, we’re here to help. As a trusted Google Partner we’re experienced in helping people like you get their campaign performing at peak levels. Get in touch if you need any advice or are looking for a professional company to help with your AdWords. Why not give us a shout, we don’t bite and you’ll find us fast & affordable! Data – the obvious conclusion is not always the right one! I love data – I love the unfolding stories they contain, but a warning for the untrained, caution is needed when drawing conclusions from data. I have a background in Econometrics and Data Analysis having completed an MSc a few years back. Now, that really opened my eyes to everyday assumptions that people make when dealing with data. Data is biased – pretty much always, & our assumptions are not much better. We don’t have the required understanding to deal with data correctly. One of the most common misunderstandings is around endogeneity, essentially, biased data. Here’s a great example of biased data leading to dubious conclusions – inspired by “How Not To Be Wrong” by Jordan Ellenberg – a great read if you’re into a bit of maths! During the Second World War US Bomber Command were looking at ways to protect their aeroplanes. You don’t want your planes to get shot down, so you put armour on them. But you don’t want so much armour that they become unwieldy and sitting ducks to marauding German Messerschmitts. So you optimise the placement of the armour. Bomber Command enlisted some mathematicians to help solve the optimisation problem, presenting them with the data below. Where would you place the armour? Take a minute to look at the data and decide where you should place the armour. Bomber Command saw the solution was to create efficiency by only placing armour where it was needed most – i.e. the parts being hit the most. This is a fatal assumption – literally! The actual solution is to put the armour where the bullet holes aren’t. Why put the armour there? The distribution of bullet holes should be a fairly random distribution and spread evenly over the plane. But this is not borne out by the data. We see far fewer holes in the Engine section. So where are the missing holes? The missing holes are on the planes that are not being included in our sample. Those planes never made it back to base because they were too badly damaged. And that is why you put the armour on the engine section. You need to be careful when working with data that you understand its limitations. If you have biased data because of a biased sample, if you misinterpret causality or if you fail to include factors that influence outcomes; then you can make poor decisions which you believe are based on fact. Does having a video on your website help improve your Google ranking? A lot of people claim it does. I’ll leave you with that one! Finally, if you want to improve your statistical knowledge, “How Not To Be Wrong” is an eye-opening and entertaining read. And it also details how a bunch of MIT students cracked the lottery! Each generation likes to communicate differently. Baby-boomers love the phone, Gen X, like myself are compulsive emailers, but the younger Millenials have grown up with text & instant messaging and expect to be able to communicate using their preferred channel. To make it easy for people to get in touch with your business, whatever their generational label, Google have introduced the “message extension”. This is simply a little button that appears on your ad that allows people to message you a question. As you can see, it’s very similar to the “call extension” that proves popular with users looking for a quick answer and to skip the whole website navigational challenge. It essentially removes an obstacle to contact. What’s so great about text message extensions? What should you consider before introducing Text Message Extensions? Do you have the resources to respond immediately? Text messaging is very instantaneous. People will expect a prompt reply, so if you won’t be able to answer straight away, text messaging might not be for you. Do I want to be interrupted by messaging at all hours? This AdWords extension, does let you create a custom schedule, so you don’t have to be woken at 3am with that SMS bleeping, but what about during the working day? Will you be able to cope with the interruption and demands of the text message? While text messaging, on the surface, seems like a quick communication method, I’m sure you’ve have those ping-pong like messaging rallies that seem to go on forever and wonder why you didn’t just pick up the phone and call in the first place! How do I get AdWords Text Message Extensions? To enable Google AdWords text message extensions, you simply need to have a phone capable of sending / receiving text messages. Set up the extension in the usual way as you would for a call extension, but you get to choose the text for the extension e.g. “Send us a text”. Naturally, the text extension will only show on devices capable of sending texts! If you want to know more about Advertising On Google, read more here. Or if you’d like help with your online advertising, why not get in touch? Ever wanted to get into digital marketing? Read about what it takes here. Aim Skills is a training provider that can help you upskill yourself or your staff & even help you find an apprentice. There is funding available, so why not take a look? Everyone’s got one, some are bigger and more impressive than others. But who looks theirs daily? A good hard stare. Yes, I’m talking about the overlooked & unloved Google Analytics Account. Let’s see if we can improve your website & Google Analytics Reporting. By God, analytics is boring & I should know having an MSc in Data Analysis, yawn. And it’s also complicated. So, for these reasons people pay no attention to their Google Analytics reporting, even though the answers to Website Conversions great mysteries lie within. So here’s five simple tips you can implement today to get more out of your analytics, understand your website & customers better and hopefully improve your online sales performance. The first tip is straight forward. Make a dashboard. Nobody knows how to navigate the Google Analytics Reoporting Interface. You can never find what you need – if that is you know what you need! So create a dashboard that shows you the key information you need on one page. Use the built in charts to present the data visually, the human brain is great at recognising patterns, so you’ll pick up much more that way. Making dashboards can be complicated – more so if you don’t know what information you should be looking at. But let me introduce you to the Google Analytics Solutions Gallery. Here you can just download pre-built dashboard straight to your account, no messing. Awesome! So once you’ve got the reports you need, it’s still a pain logging in to the account and viewing them – and there’s always something better to be doing. So wouldn’t it be great if you could just have them delivered to your inbox every week, day or month? Well, surprise, surprise, you can. Just select your report & click email at the top of the screen. You will probably see you are getting lots of traffic, but take a closer look & you will see it’s coming from exotic place… and Russia. Guess what, it’s spam, not real. You’re going to want to filter that out so that your account is a true reflection of your website performance. Read more about this Google Analytics spam traffic & how to eliminate it here. Once you have goal tracking in place you will start to understand what channels are effective at converting visitors to customers – then you can stop doing all that Social Media! It will help you measure the impact of any changes you make to your website or online marketing. Really, this is the single most important change you can make to improving your online performance and Google Analytics Reporting. Here’s a quick visual guide to creating goals. Don’t forget, the Solution Gallery can help here also! Once you have your segments you will begin to mine the rich seam of data for insight that will actually improve your business. Many segments are auto created in the interface, but again, the Solutions Gallery has the answer to more complex reporting. Applying a segment is really easy, as shown in the images below. I hope you find these tips useful. If you have any questions, please feel free to leave a comment or get in touch.